What's It Take To Get A Boxer To Return Your Calls? Arturo Gatti couldn't make Fight Night Champion. 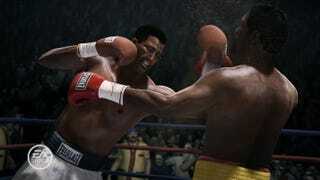 It's not because he's dead - so's Sugar Ray Robinson, and he's in the game. It's just that negotiating likeness agreements with boxers is head-bangingly more frustrating than in any other sports game. Answering whining customer complaints about the omission of some fighters - most of them known only to boxing cognoscenti - Fight Night producer Brian Hayes took to the EA Sports forums yesterday with a candid explanation. Gatti is the biggest name not on the list, but as Hayes explains, he "died under very suspicious circumstances. "Sorry that we weren't able to re-do that contract in the wake of that. We would have signed him for an extra 2 years way back if we had known he was going to die," Hayes said, adding an eye-rolling smiley for effect. "All of the boxers that we lost were contacted, some of them several times by myself personally," Hayes wrote. "I'm not kidding when I say this, sometimes we just don't hear back. Even from people we worked with previously. I personally had communications with one boxer - and his three different managers - over the course of 6 months." Hayes added that "it's not like boxing is chock-full of stand-up guys accustomed to a strict code of business ethics - nor is it populated by an abundance of athletes with a realistic perception of their brand value and/or mainstream appeal." That said, "Some guys are absolutely great. Very professional and very helpful."